Strap-free with no pressure points, the jumper is suited for short and long-term wear. 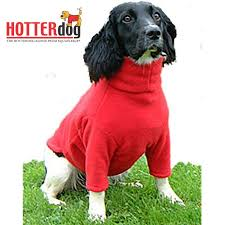 Not only is the fleece water-repellent and washable but also it is extremely effective for drying off wet dogs such as working dogs or after swimming or hydrotherapy. 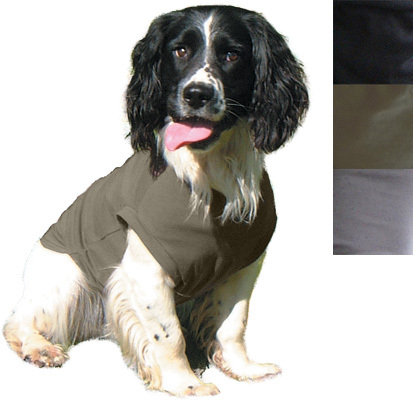 The fleece fabric is expressly designed to wick moisture away from the body into the atmosphere while retaining body heat – a much more effective and comfortable alternative to leaving a dog in a wet towelling bag. 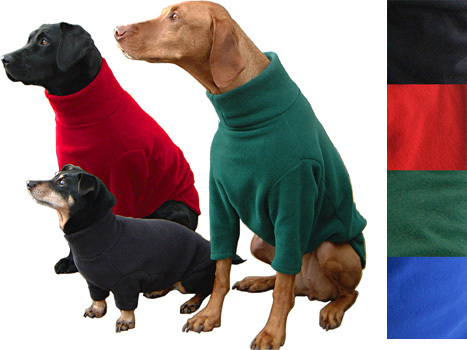 The HOTTERdog Jumper comes in 5 sizes, Chihuahua to rottweiler and in 5 colours: black, red, forest green, grape and royal blue. 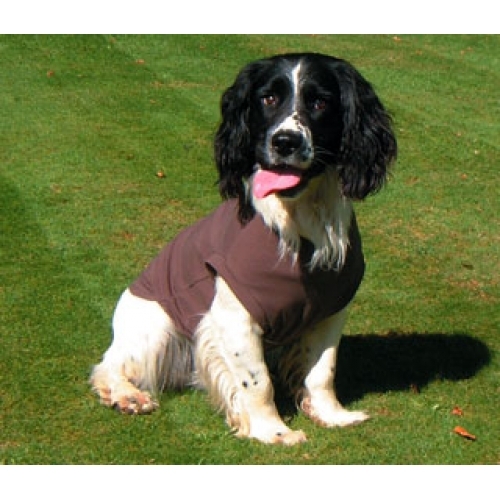 Let us embroider your dog’s name on their jumper, or for that extra special touch add their name and a paw print motif. 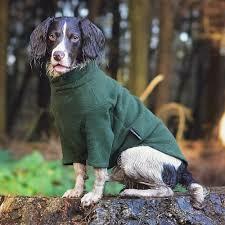 Personalisation costs £5 per jumper have a name embroidered. The T-shirt Body is the perfect garment for dogs with rashes and grass allergies, hair loss or keeping dressings in place. T Shirt Size Choose an option35cm/14″40cm/16″45/50cm - 18/20"55cm/22″60cm/24″65cm/26″70cm/28″81cm / 32"
Let us embroider your dog’s name on their t shirt, or for that extra special touch add their name and a paw print motif. When choosing a colour for the embroidery pick a colour which contrasts with the colour of the t shirt. Personalisation costs £5 per t shirt have a name embroidered.